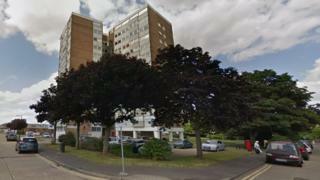 A man has been arrested on suspicion of attempted murder after a woman fell from a fifth-floor window. Essex Police said the woman in her 40s had been taken to hospital with life-threatening injuries, after falling from an address on Jones Close, Southend, at about 02:00 GMT. The arrested man is 44 and from Southend. Police said they would like to hear from anyone who heard or saw a disturbance in the area.